I'm trying not to beat myself up by comparing my progress over the past week with everybody else. Especially those of you who have had sick kids at home. I don't even have any kids at home anymore. Go to Freshly Pieced where you can see what everyone else has been up to in the last week. Yikes! There is a lot going on out there. Binding machine sewn on Levi's quilt. Now it's back in Christa's hands for hand sewing it on the back. Yep. That's about it. See you next week. you have some fun projects going on, no matter how far you've gotten since last week. Who's keeping track anyway?! Fun to see the variety of inspiration you always offer! I really love those last two blocks, so cute, and such fun colors. I have no sick kids and my progress is pretty slow, so don't feel bad. I really like the WIPS.everyone works at their own pace.somedays I get alot of sewing done,others I think of things I want to make..no race here. Yum, I can't wait to see that stashbuster block! That's been on my patterns-to-try list for a while now. And hey, I think you're making plenty of progress! It's not about speed, it's about making beautiful things, and you certainly did that. Great blocks! I won't compare you to anybody as we all need to move at our own speed. 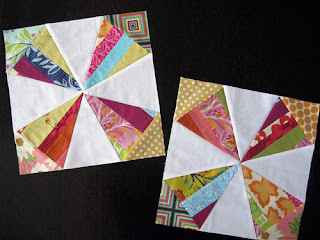 Love your do Good blocks, very pretty! I feel like you do all the time, always a day late and a dollar short! Oh well, I try not to worry about it! You silly thing.....all you have to do is drink coffee right before bed....then you'll have a good 8 hours to sew all night! That quilt is amazing! Can't wait to see it finished... Don't beat yourself up because that is a great WIP-almost finish! You accomplished more than me!!! Hey, comparing ourselves is not allowed in WIP Wednesday! : ) That's the whole point of WIP posts ... if you can't get a lot done, you still have something to show off. The only reason I've gotten so much done recently is because I have DEADLINES, oh so many of them! Love those Do Good Stitches block, they're great. Thanks for linking up, have a wonderful week.